This book and the main character, Libby's, frustrating moments reminded me of myself in my life right now. I could definitely relate as one thing after another went wrong! This book had me at the edge of my seat with the suspense from the kidnapping, praying that they would find her kidnapped friend, and willing and urging her new found family to accept her! I wanted everything to work out for her in the end! After reading this book, I wish I could visit Hope Beach because it sounds heavenly as Colleen Coble describes it! Her writing is so expressive and descriptive and it really made the book amazing to read! Check out this book for a little suspense, romance, and a beautiful vacation destination! 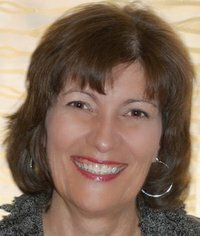 Colleen Coble writes with amazing descriptive words and carries you throughout her drama, romance and suspense-filled book! Along the way, she reminds us of the greatest promise of all: God is there with us, he has a plan, and he will never forsake us! It is a great message I think all of us need to hear on a daily basis! Celebrate with Colleen by entering to win a $500 gift certificate to BedandBreakfast.com! 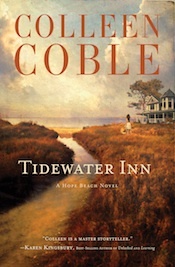 A copy of Tidewater Inn. Enter today by clicking one of the icons below. But hurry, the giveaway ends on August 22nd. Winner will be announced at Colleen's "Tidewater Inn" Author Chat Facebook Party on 8/23. Colleen will be sharing the story behind the book, hosting a book chat, testing your trivia skills, and of course, there will be plenty of fun giveaways - books, gift certificates and a Book Club Prize Pack! She’ll also be giving a sneak peak of her next book too! Don't miss a moment of the fun. RSVP today and tell your friends via FACEBOOK or TWITTER about Colleen's giveaway and increase your chances of winning. Hope to see you on the 23rd! Wow- sounds like a great review! New GFC follower. Found you on Top Mommy Blogs. I'd love to have you link up to the Weekend Blog Walk blog hop and follow at http://www.athometake2.com. Looking forward to reading more of you blog.